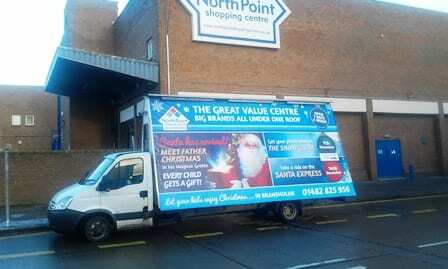 North Point Shopping Centre have successfully utilised a Gorilla Media AdVan to promote their festive events. Displaying a 48-sheet banner the AdVan was strategically located in the surrounding areas and busy approach roads, increasing awareness and footfall. Located in Bransholme, Kingston upon Hull North Point Shopping Centre required a cost-effective medium to highlight these date specific events, and a mobile billboard was a cheaper alternative than the press.